Tequila is Mexico's national drink, hugely popular with locals and tourists alike. It is the only place in the world where Tequila is grown, harvested, and distilled, and now you can be part of the process! You'll visit the blue agave plantations where the tequila plants are grown, and see La Vinata, the oldest tequila distillery in Sinaloa state. This is definitely the ultimate Tequila tour in Mazatlan. Visit the colonial town of La Noria, where natives make pottery, leather saddles, leather sandals, belts, machetes, etc. Everybody here makes something! La Noria is a taste of real Mexico, with it's local cowboys, rodeos, antique church, and adobe houses. Visit a family making their living making pottery before visiting the biggest blue agave plantation in Sinaloa, and La Vinata, where the tequila is distilled in a very rustic system - the oldest tequila distillery in Sinaloa State! Visit El MesÃ³n de la Abuela Tina, where lunch is served in a very authentic and traditional way, leaving you wishing you could visit again very soon! 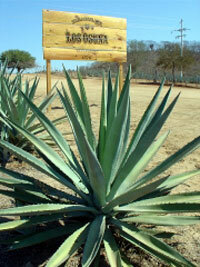 Sample some of the fresh-made tequila at the ranch with free tequila tastings! Compare to "Huaraches, Saddles, & Tequila Factories"
If you want to see where tequila is really grown, really harvested, and really distilled, not just a tourist trap in the city set up to sell you tequila, then this is the tour for you.